Margaret is a sweet baby girl, born July of 2016, with a gentle disposition and a ready smile. She is closest to the caretaker in her room and her caretaker would add that she is active and lovely. 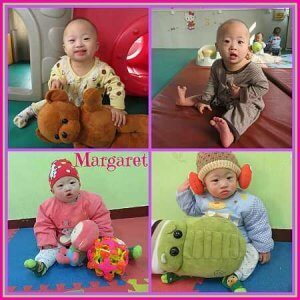 Margaret likes listening to music and playing with toys, especially musical toys and toys that are brightly colored. Margaret can roll over, sit independently, and army crawl. Her fine motor skills are good. Margaret has typical delays in language and cognition for a child with down syndrome. She can make sounds and she is a good sleeper. Margaret’s official diagnosis is just down syndrome, but within her file it notes that Margaret has and . We hope Margaret will find a family while she is still so young!